Valve follows up last year's value packed The Orange Box with a new take on what it does best: the first-person shooter. Left 4 Dead pits four players against a festering endless stream of undead, forcing them to work together to survive through four escape scenarios. Left 4 Dead switches the multiplayer formula up with an option to play as the undead, letting the player take control of one of four "special" Infected zombie types to prevent the four Survivors from making it to safety. It's a rather straightforward run and gun (and occasionally puke) fright-fest, but it's also one of the most hyped, most heavily anticipated games of the year. Is there reason to get excited? See how terrorized we were by Left 4 Dead in our review. Be Ready To Face The Horde: The number of games that can elicit genuine jumps of surprise and such an extended string of profanities, as Left 4 Dead expertly can, are few and far between. This is not a psychological horror game, it's purely physical. Your survivor can be attacked by the living dead from any angle, from any location as the smart level design ensures that you'll never feel safe anywhere, even when you're back is against the wall. Zombies will pop out of air ducts, through drywall, from rooms you mistakenly thought were empty — there's a real feeling of being hunted by an overwhelming force. The dynamic horror-cliche score adds a great sense of dread. Getting Infected: Playing as one of the four human survivors is a blast, as mowing down legions of the undead is a formula for fun. But playing as the Infected in Versus mode is pure, uncut, grade-A bliss. Strategizing with your undead teammates can make for thrilling white-knuckle, swearing into the microphone action, the type of multiplayer experiences you'll be talking about well after your game is over. Batting hapless Survivors to death with the Tank is a joyous violent release. The Versus mode's alternating teams ensure that everyone gets a chance to enjoy both factions and never gets bored. The Evil A.I. Director: The level design may be static, but the artificial intelligence that controls where ammo, health supplies and zombies, Boomers, Smokers, Hunters and Tanks appear guarantees that each play-through feels fresh. During a single-player session, the A.I. director surprised me with a Witch I was fully expecting to be in the opposite corner of the room from a previous attempt — a quick tutorial in expecting the unexpected. Great Sense Of Apocalyptic Humor: You may be surrounded by animated corpses and the stench of death, but that doesn't mean you can't laugh about it. Valve has peppered subtle in-jokes and laugh out loud dialogue throughout. The pun-laden scenarios and faux movie posters make the apocalypse less depressing. 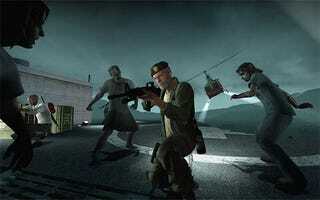 Friends Required: Left 4 Dead's main draw is multiplayer. Playing with a tight, organized team of survivors (or infected) can make or break the experience. Make friends, convince them to play Left 4 Dead with you, and watch those friendships blossom. Substance And Style: The game's deep well of replayability clinches Left 4 Dead's spot on the list of best multiplayer games of the year. It's arguably one of the best multiplayer games of all time. I'm longing to end writing this review and play some more. The game is as pretty as it is playable. Well, it's pretty in its ugliness, with dirty, dark visual effects and gorgeous, understated design. The Source engine may be getting a little long in the tooth, but Valve has tweaked it and polished it to stay graphically competitive. That's It? That's It: If you aren't sucked in by the game's multiplayer aspects, you're not going to find much else worthwhile in Left 4 Dead. Playing through the single-player version of the campaign will net you about six hours of gameplay, more if you ramp up the difficulty. It's fun, but can't hold a candle to playing with a group of flesh and blood buddies. The developer commentary will add a dash of replayability, but don't expect much in the way of exposition or resolution for this whole zombie apocalypse thing. The weapon selection feels a little barren, Versus mode can only be played in two of the game's four scenarios and, well, there are only four scenarios. The Steam version is assumed to be the better deal, as you'll likely pay to expand upon the Xbox 360 version with whatever new scenarios and content Valve has planned for the title. The limited amount of content in Left 4 Dead does feel like a knock on the game's value. Those investing in the Xbox 360 version may feel a bit cheated by what's included in the package, but given the ratio we expect to devote to the game's rich multiplayer portion, it's worth the money. And despite my personal preference for keyboard and mouse controls, the Xbox 360 version plays brilliantly with a controller on default sensitivity settings. I've already logged about sixteen hours with Left 4 Dead on the Xbox 360, a figure I expect to be but a tiny fraction of my total play time. I'm addicted. It's rare that I enjoy a game this much from the get-go. This is a brilliant, tightly executed shooter that feels fresh and exciting. It may be a little light on content, but it has easily supplanted my other online multiplayer gaming choices as the title that will soak up the majority of my free time. Anyone looking for a different — but not too different — take on the first-person shooter genre can't go wrong with Left 4 Dead. Left 4 Dead was developed by Valve and published by Electronic Arts, released in North America on Nov. 18 for Xbox 360 and PC. Retails for $59.99 USD on Xbox 360, $49.99 on PC. Played through single-player campaign on Normal difficulty, played multi-player campaign on Advanced and played many, many Versus mode matches on Xbox 360. Tested PC version.